The color shaded relief image used as the base for this globe has a resolution of 32 pixels per degree (approximately 1850 m/pixel), and was produced and supplied by the MOLA Science Team. The image is shaded as if illuminated everywhere from the west. 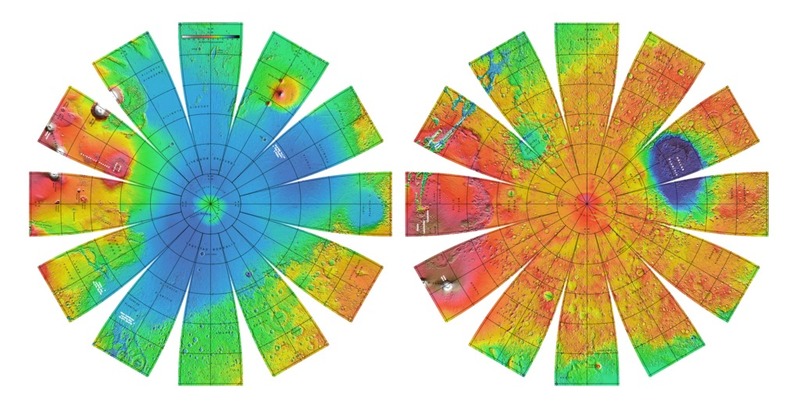 The elevations represented in color are with respect to a gravitational equipotential surface whose mean equatorial radius is that of the topography. The Astrogeology Research Program of the U.S. Geological Survey reprojected the image into the format displayed above. The images are presented in a projection that portrays the entire surface of Mars in a manner suitable for the production of a globe; the number, size, and placement of text annotations were chosen for a 12-inch globe. Prominent features are labeled with names approved by the International Astronomical Union. A specialized program was used to create the "flower petal" appearance of the images; the area of each petal from 0 to 75 degrees latitude is in the Transverse Mercator projection, and the area from 75 to 90 degrees latitude is in the Lambert Azimuthal Equal-Area projection. The northern hemisphere of Mars is shown on the left, and the southern hemisphere on the right.